For the Smokeout one year, I came up with a fun idea: I solicited prizes from various local merchants and offered them to the person who could kick a cigarette pack the farthest on Smokeout day. The event attracted a lot of local TV coverage. On Thursday, November 20, America is kicking the habit for a day. 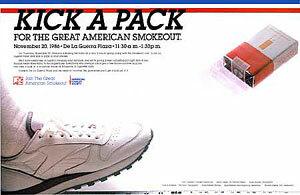 If you're going along with the Smokeout, come to De La Guerra Plaza and kick a pack of your smokes. We'll have celebrities on hand to measure your distance, and we're giving prizes (including a two-night stay at San Nicolas Resort/ Baja) to the longest kicks. Everybody who kicks gets a free Maire's Sundae. And you can take a look at a sculpture made of thousands of cigarette butts. Come to De La Guerra and be mean to nicotine. We guarantee you'll get a kick out of it.